Summary: What should I feed my puppy? “Organic vs. store bought dog food or do I just need to have a variation in my new puppy’s diet?” Or maybe you are asking, “I’d like to change the puppy’s dog food because I really don’t like the type that the breeder was using.” What to do? 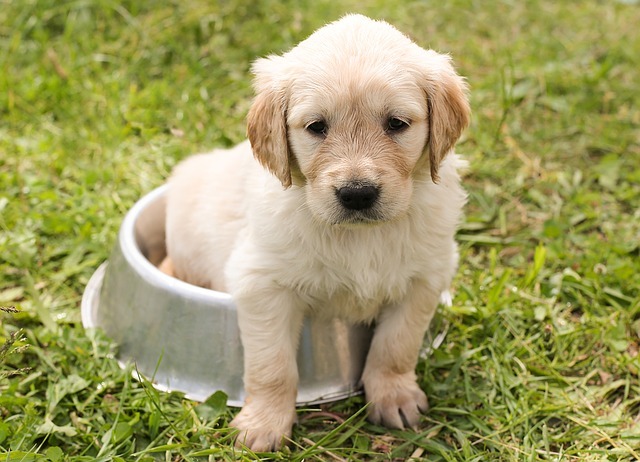 We attempt to clarify ‘What I should feed my puppy’ in this article. We have heard this question many times throughout the decades of dog breeding we have been through. We cannot emphasize it enough that “consistency” is a very important part of your puppy’s diet. You should feed your puppy the same kind of puppy food every day. A puppy’s digestive system cannot handle changes in food. Puppy’s do NOT need a change in diet to be happy. Many times, we have met first-time dog owners that have read some article about why they should feed their puppy a specific food. We try to tell them the importance of ‘consistency’ in their diet to no avail. And sure enough, we get a phone call shortly thereafter asking why their puppy has diarrhea. Give the puppy a break. He or she has just left its surroundings and is adjusting to a completely new environment and boss. Don’t change the food on him or her for the first week or two of being with you. Make the change gradually. Mix portions of the old food that they are adjusted to with the new food phasing it out over several days or so. Again, puppies can experience diarrhea if their food is changed abruptly. We strongly suggest that you get your puppy into a regular routine. That includes eating at the same time every day. Your puppy should have fresh drinking water always available. A good recommendation is to follow the guidelines on the packaged puppy dog food for feeding amount. Remember, your puppy is growing tremendously fast and requires proper nutrition just as any living thing does. When looking for puppy food carefully read the label and choose a puppy food that has the first ingredient listed as meat. The first ingredient listed is what the food is mostly made out of. There are several fine choices available. As far as organic puppy dog food products, there are many out there and just as many people who wouldn’t feed their pets anything but organic and natural foods. You are the one who has to decide what is best for yourself and for your pets. The choices are many. Study it out and make the best decision you can. Breeders in your area and local Veterinarians can be a good avenue for trusted advice. Amazon.com’s best selling puppy food is Taste of the Wild High Prairie Puppy Formula with Bison and Roasted Venison Dry Dog Food, 30-Pound Bag . It’s made with real roasted bison and venison meats, fruits, and vegetables. They also carry other types including lamb, salmon, and wildfowl. Bags are shipped in 5 pound, 15 pound, and 30 pound sizes. This dog food is packed with ‘highly digestible protein and antioxidants’. I have a female Chihuahua and a male, she weighes about 6.0 lbs and he tops the scales at 2.8 lbs., My female is a rescue dog but the male I bought as a play mate for her, any way I just wanted to say I have never given my dogs store bought dog food, I have been making thier food for them, I did this only with my Vets approval and I give them a vitamin, every day. There are some very good choices on line, and also so fun dog treats you can make, all the food that I fix is salt free and all natrual, it’s nothing I wouldn’t eat,they have regular check ups and my dogs are doing great. My Vet says they are some of the healthest dogs he’s seen, and if more people would reconsider what they put in thier dogs stomach’s we might have less cancer in our little loved ones. I enjoy the process of making thier food and it cost’s no more then buying the dog food that my Vet sells. Making your dogs food may not be for every one but, I do wish more people would at least read about it and maybe see how much better it would be for thier dogs. Just a thought. I have a almost 8month old and a 4month old large breed dogs… i want to go organic, meat/veggie… however the dry food option available to me is very pricey… is there any cheaper then $30 for a 20pound bag for large breed puppies that offers meat/veggies only… I thought of Taste of the Wild, but again, they both are Large Breed Puppies…. Do i keep feeding them both puppy food even tho my lab puppy is 4months younger than my golden mix when my golden mix becomes an adult? Proud Mama of 2 little girls and 2 female furbabies. 1 Golden retreiver/Great pryenees mix and 1 Black Lab.